For marketers, creating a marketing campaign is of supreme importance, which takes ample amount of time, strategic thinking and market research. Let’s assume you have invented a really creative and unique marketing campaign after putting your efforts. The next important step is to measure the success of your marketing campaign. This requires the tools to analyze campaigns, generating reports, understanding the weak points and improving your marketing campaigns to make it even more successful. In this article, you will learn about the three important things to measure the success of your marketing campaigns. You would need to familiarize yourself with google analytics which will be your favorite companion. For running a successful marketing campaign you have to discover the source of your traffic. How would you know which campaign is driving more traffic? Which marketing campaigns are driving the most successful leads? Let’s move on to further understand in detail how you can actually capture the source of your campaigns in analytics account. UTM(Urchin Tracking Module) is a simple code/parameters you can add to the end of your custom URL in order to track the source of traffic. It is also known as UTM parameters which send data to your analytics account. You can track five things using UTM parameters. The site that is responsible for sending you the traffic. It can be facebook, twitter, google+ or any other site. This parameter is specifically used for paid keyword terms. If you are paying for keywords using PPC, this must be used. There is no any such rule defined for using UTM parameters. You can use in any order but make sure to separate each with ‘&’ and add ‘?’ after the end of URL. 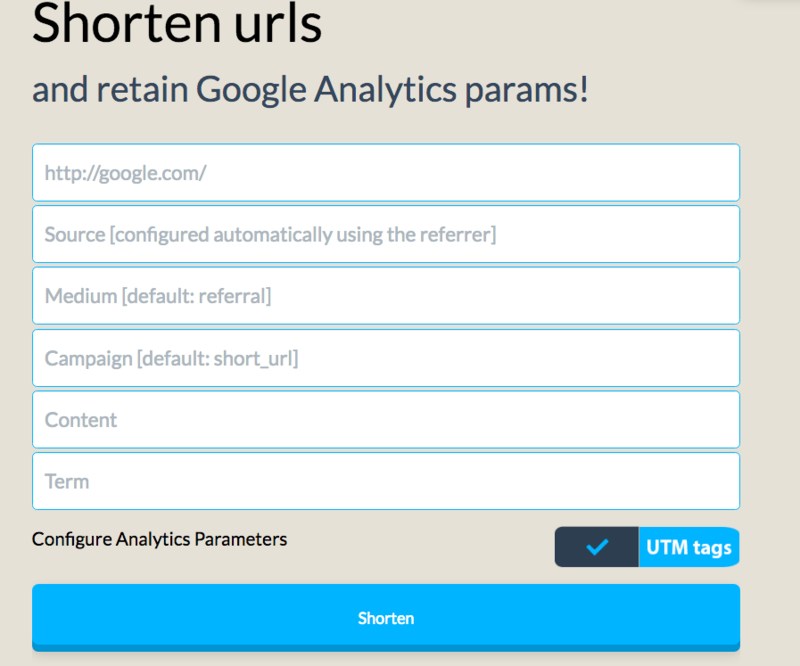 This is a very simple tool which does not only add UTM tags but also shortens the URL while retaining UTM parameters. Google campaign URL builder is also a very simple tool for adding UTM parameters. You just need to enter the required information and it will automatically build URL for you. How to see campaign reports in Analytics? Once you added UTM parameters to your campaigns, you can easily see data in google analytics. In order to view campaign reports, navigate to Acquisition >> Campaign >> All Campaigns. The above reports show data about different campaigns, you can change the primary dimensions to view data about the only campaign, source and medium. You can measure which marketing campaign is successful and which is more relevant to your audience. Google Adwords is more helpful for developing a successful marketing campaign. It allows you to advertise your business for a specific keyword to your relevant audience. All you have is to think about how much you are going to invest on your Adwords campaigns, create a clickable ad and select a specific keyword that matches your potential audience. If you are new to Adwords click here to sign up for an Adwords account and start your Adwords campaigns. If you are still confused here are 9 Steps to Setup your Google Adwords Campaign. The next step is to link Analytics and Adwords to view reports about your campaign. Once you link Adwords with analytics, you will be able to view your Adwords reports in analytics. To view Adwords campaign reports in analytics navigate to Acquisition >> Adwords >> Campaigns. Google analytics will only track the pages where you have inserted the analytics tracking code. In order not to miss any data, you must add analytics tracking code to all pages of your website. If in any case you have missed adding analytics tracking code on a page, you would not be able to see accurate reports. If you are not viewing accurate reports then you are not able to measure the accuracy of your marketing campaigns. How do you know if the tracking code is missing on a specific page? Below are some indications for missing tracking code. If the tracking code is missing from your site, you will not be able to see real time and any other reports. If the tracking code is missing on a single page, that page reports will be missing from the overall reports. Your site might have thousands of pages and it’s quite difficult to check which page is missing the tracking code. Using gachecker you can find which pages are missing tracking code and what kind of tags are installed on your pages. Here is a list 29 Common Google Analytics Data Errors & How to Fix Them. If you are facing errors while migrating to Google Tag Manager, check our guide about safe migration to GTM(Hitch Free Google Tag Manager Migration). A successful marketing campaign will always generate more goal conversions and more revenue to your business. It is very important to measure the goal conversion or revenue tracking of your key pages for which you have designed campaigns. If you have started an Adwords campaign for a specific product, you should be tracking sales for that product. If the Adwords campaign results in an increase in your site revenue, then the campaign is running successfully. Google analytics does not just help you get the traffic reports but it also displays the goal conversions and revenue information. For viewing the goal conversion reports you will have to first set up goals in your analytics account. To view the goal conversion reports in analytics move to Conversions >> Goals >> Overview. The above reports show data about all goals in your analytics account. To view the revenue of your ecommerce site, you will have to enable ecommerce tracking in analytics account. Once you set up ecommerce tracking you will see the product revenue in the product performance reports(Conversions >> Ecommerce >> Product Performance). For measuring a successful marketing campaign you will need to track the source of your audience(campaign tracking), consistent code on all pages and goal conversion/revenue tracking. I am pretty sure that the above 3 things will help you measure your marketing campaigns and also help you improve what you have missed.